I can’t remember if it was when Dan Lauria was starring in ” “A Stone Carver” by William Mastrosimone at The Passage Theatre in Trenton or when “The Wonder Years” TV Dad was in “Inspecting Carol” by Dan Sullivan at the George Street Playhouse in New Brunswick, that he told me in an interview he was only interested in doing plays by living playwrights. And he’s been doing that for all of his 40 years in show biz. Even while he was working mostly on TV and in film. Lauria loves being on stage and seems to like doing so in New Jersey. He also did “The Winning Streak” by Lee Blessing and “The Value of Names” by Jeffrey Sweet at George Street. Now he’s at New Jersey Repertory Company, 179 Broadway, in Long Branch starring in a four-character play he wrote. Hopefully that doesn’t include theater critics. 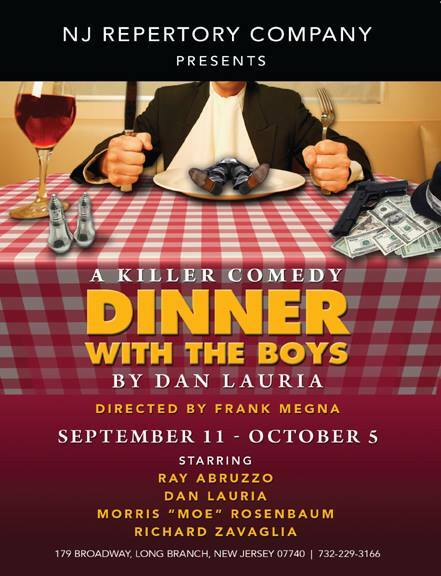 Besides Lauria, the play features Ray Abruzzo, Morris “Moe” Rosenbaum and Richard Zavaglia. Performances run Sept. 11 through Oct. 5. Click here for more details. NJ Rep includes two small performing spaces where no one is ever more than maybe 50 feet or so from the stage. There’s easy access from the NJ Coast Line train station and ample parking. Kudos to Lauria for not only devoting his skills to live theater but doing so in small theaters. Theater lovers in central New Jersey are grateful. That’s not to say that Lauria doesn’t love Broadway. He played the title character in “Lombardi” from Oct. 2010 to May 2011 and Jean Shepherd in “A Christmas Carol” in 2012 and 2013, both on Broadway. Nice shout out to the Passage Theatre. Read the whole interview here. — Lauria is a Vietnam War veteran, having served as an officer in the US Marine Corps in the early 1970s, at the same point in his life that Jack Arnold, his character in “The Wonder Years” did during the Korean War. — He got his start in acting while attending Southern Connecticut State University in New Haven, Conn., on a football scholarship. — He was born in Brooklyn and grew up on Long Island.